After a 3-day stop in the Bay area for the Giants and A’s, I headed back on the road with Marty down to Los Angeles with a brief stop in Stockton to drop him off at his home. Although most east coasters assume that San Francisco and Los Angeles are both in California and therefore close to each other, they are actually only close if you consider New York City and North Carolina close. Then you have to add the dreaded LA traffic, which is quite real. I also made the mistake of staying in Anaheim figuring that it would be easy to commute between Anaheim and LA since they are so close, but LA traffic made it seem much farther, but I left early enough to make it to Chavez Ravine in plenty of time for the game and my pre-game photo ritual. As we all know, the Dodgers left Brooklyn after the 1957 season to come to play in Los Angeles. They played their first 4 seasons at the Los Angeles Coliseum before Dodger Stadium opened in 1962 at Chavez Ravine. To me one of the most fascinating things about Dodger stadium is how it was built on a hill, which allows the parking lot to be set up in levels. This means that you can park effectively at either field level or at the upper deck level or in-between and enter the stadium at the level of your seats without the need for in-stadium escalators to get to you there. The escalators and stairways are mostly in the parking lot, which is unique to any other stadium that I have visited. In addition, due to the location of the stadium, you have excellent views of downtown and the San Gabriel Mountains from the parking lot and in the stadium itself. The surroundings are quite beautiful. If you take away the surroundings and the multi-level parking lot (which you can’t and shouldn’t) Dodger stadium has an amazing resemblance to my home away from home: Shea Stadium. 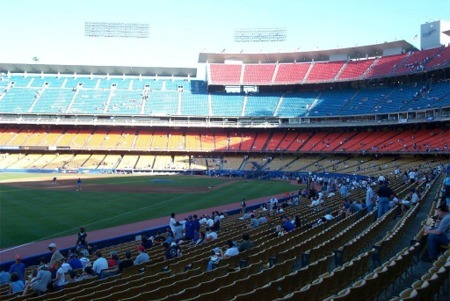 They both have four levels of seats with multiple colors, are horseshoe shaped with open air beyond the outfield, and were built roughly at the same time (Shea was completed in 1964). Considering that the Mets color scheme incorporated their blue from the Brooklyn Dodgers, it makes sense that even the colors are similar. 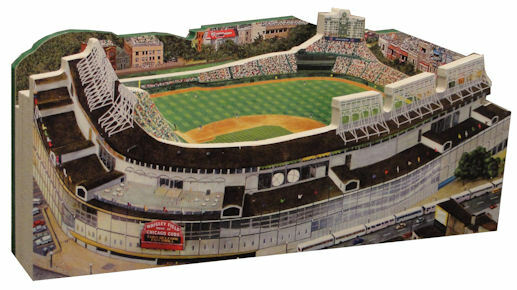 The other difference is that the upper deck in Dodger Stadium does not make it all the way around to the outfield. Admittedly, the weather and views at Dodger stadium are considerably better than Shea Stadium, especially considering that rainouts only happen once every several years. Interestingly enough, I had a bit of a hassle getting into the stadium with my clear backpack because of the tight security at the stadium. They said it was too big, but eventually caved and let me in with the bag. An amusing and surprising quote from the security guard was that Dodger Stadium is the safest stadium in baseball because of their security measures. 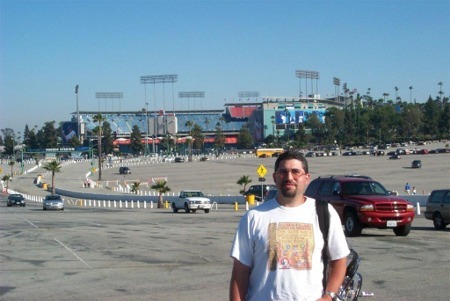 The amusing part is that I am writing this segment years after my visit, and to say the least, Dodger Stadium has had a few horrible security and violence issues in the recent past. Another big difference in Dodger stadium is the much wider concourses by the concession stands. This way people do not have to crowd and bump each other on their way to buying the famous Dodger Dogs. This is where my baseball fandom conflicts with the average baseball fan. I hate hot dogs, so to me a Dodger Dog is just as bad as any other hot dog. Many people rave about them or squawk that they are over-rated, but to me, they are just a lousy hot dog. The rest of the food options were not all that impressive, just your typical fare plus Carls Jr., which is kind of typical in California too. The Dodgers do honor their team history with retired numbers of players from both their days in Brooklyn and in Los Angeles on the walls in the bleachers. Some notable Players are Jackie Robinson, Roy Campanella, Sandy Koufax, and Tommy Lasorda. They promote their current stars with large banners on the outside of the stadium as well as in the vending concourses. The plastic seats and older style electronic jumbotrons in the outfield give the stadium a classic 60s and 70s feel, even though jumbotrons we ren’t really a factor until the 80s. Foul territory is huge here, like in Oakland, so the pitchers get an advantage, which may explain a part of the Dodgers long history of pitching success in Los Angeles. The Dodger fans clearly lived up to their Southern California reputation. They came late, paid more attention to “the wave” and hitting beach balls in the stands than watching the game, and promptly left after the 7th inning stretch. Therefore, I was not disappointed in finding those things were a myth, because they are clearly part of Dodger tradition. A fun part of that tradition though is their famous peanut vendor that always throws the peanuts to the purchasing fan, regardless of where they were sitting. His accuracy is amazing and something definitely worth glancing away from the game to see. I’ve previously been to a Dodger game against their hated rivals, the Giant, in which the score was 3-2 in the 7th, and yet the fans still left in droves. This is something I will never understand. The fans in the Northeast just seem much more passionate and vocal about their teams. An interesting tidbit was that this was the 2nd consecutive game on my journey that Mindi Abair sang the National Anthem! The game itself was quite exciting today as I got to witness another extra-inning game. Andy Ashby pitched seven solid innings for the Dodgers, only allowing single runs in both the 1st and 6th innings. Mark Kotsay scored both of those runs on RBIs from Ryan Klesko, a single in the 1st and a sac fly in the 6th. The Padres Oliver Perez was even more impressive on the mound only giving up three hits, while striking out 7 in 6 2/3 innings. His only problem was that 2 of those 3 hits were solo home runs to Mike Kinkade in the 4th and Shawn Green in the 6th. The game got really interesting in the top of the 9th when the Dodgers brought in closer Eric Gagne (to the tune of Guns’N’Roses Welcome to the Jungle) in a tie game (2-2). Gagne was in the middle of a record-breaking 84 consecutive successful save attempts. He pitched a 1-2-3 9th, but was not quite as successful in the 10th. He gave up a one-out single to Gary Mathews, who reached second on third baseman Adrian Beltre’s errant throw, then intentionally walked Mark Kotsay. Mark Loretta followed with a single to left to score Mathews. On the play Dodger left fielder, Mike Kinkade, overthrew the catcher and because Gagne failed to back up the plate, Mark Kotsay was allowed to score his 3rd and Padres 4th run of the game giving the Padres a 2-run lead. Dodger’s catcher David Ross managed to hit a home run in the bottom of the 10th, so the few remaining Dodger fans got to see lights flash around the stadium for 3rd time, since solo home runs were the Dodgers only means of offense tonight. Fred McGriff followed with a pinch-hit single, but Padre third baseman Sean Burroughs made a great play on Alex Cora’s bunt attempt to catch the ball and double up McGriff at 1st to effectively end the game. It’s amazing that I should see Gagne blow a game and get the loss in the middle of his 84-game streak…and it was his own dumb play that led to the loss!